One of my all-time FAVORITE breakfasts (or lunch or dinners) is Avocado Toast!!! I love it from the bottom of my heart. There are literally hundreds of ways to make it AND they all taste new, fresh and amazing. You can shape your avocado toast by the season and add all the great nutrients you want. There is no limit to what you can do with a little imagination and the google search bar as your friend. 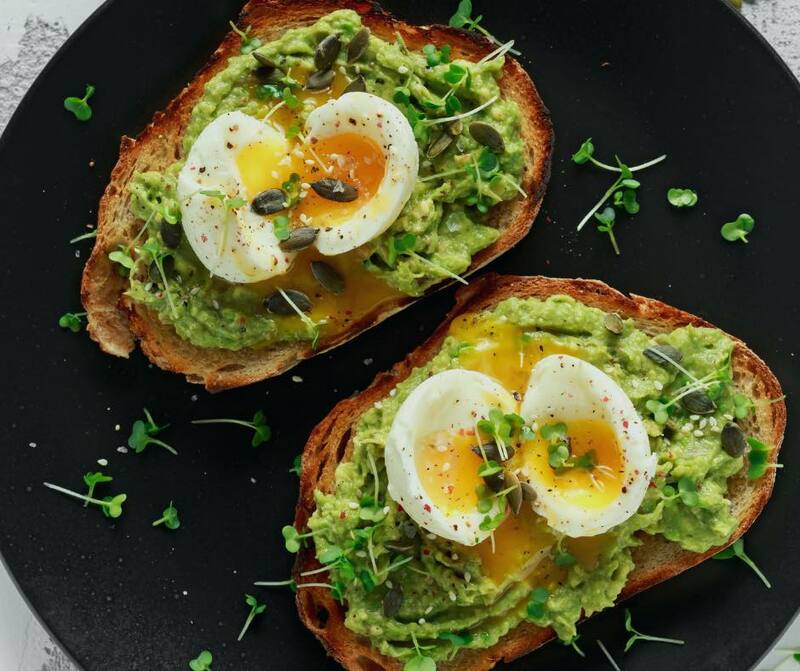 Here are 10 reasons why you SHOULD eat avocado toast. 2 – Avocados are full of heart-healthy fats!! Avocados are the fattest plant-based food on earth but not just any old fat Oleic acid which is credited with reducing inflammation and shown to have a strong effect on genes that are linked to cancer. 3 – They are easy to use and taste so good. Everyone has their favorite way to use avocado but mine is simple. I just mash it up, add some sea salt, pepper and a squeeze of lemon or lime and DONE. My kiddos even eat it off the spoon, just like that! We all need more fiber in our lives and avocado gives you that in spades!! Fiber helps contribute to weight loss, reducing sugar spikes and is very strongly linked to body defense for numerous diseases. Heart disease is the biggest killer in the world and we know diet can play a key role in the reduction of it! 6 – The fat in avocados helps you absorb other nutrients. Fat is a great way to make nutrients soluble so I use avocado daily in my green smoothies so my body can absorb all that goodness I’m drinking! 7 – It makes your skin glow! Simple beauty tip! Your skin will LOVE avocado. Eating them regularly can have a wonderful effect on the “glow” your skin (and hair, and nails) presents to the world. 8 – It can help you drop fat. I know it seems counterintuitive that eating fat helps you drop fat but that’s exactly what it does (in moderation). Why? Well, people feel more satisfied when they at good fats and due to the fiber, it helps you stay full longer! Tests are still limited and new but early results seem promising. In addition, avocado has been shown to help ease the side effects of chemotherapy. 10 – You can use them 1000 different ways. Just on avocado toast alone, you can make it differently based on the day and your mood. You can adjust for the season and be creative. There is no end in site! Be creative and have fun! So what are my favorite ways to make it? Well, like I said your choices are ENDLESS but I will list a few of my favorites below. Remember to be creative and have fun. I always start with a solid base of healthy bread. Great options I love are Ezekiel Bread, Daves Killer Bread, or any locally made bakery bread. The goal is a bread that has very few ingredients and the ingredients it does have are fresh. You want your bread to go bad FAST…that means it’s fresh and it’s good quality. As far as your avocado goes, there are many ways you can put it on your toast, it pretty much comes down to the presentation you want. You always want to start with RIPE avocado that is soft without being too soft and past its useful date. Also, always wash the outside on the avocado (skin) to make sure you aren’t passing along any chemicals or germs that may live on the skin. You can slice the avocado thin and fan it out or you can mash it up and add in salt, pepper, lemon or lime just for flavor. Other things to add inside would be garlic or turmeric – great place to hide it from the kids. This is just your BASIC avocado toast. I toast the bread, mash up the avocado, cook an egg over-easy. I also add mixed greens and tomato. Ready to really LIVE this summer? Join Michelle and her coaches as they help you get off the sidelines and really enjoy your life in a new way this summer! Our six-week challenge will start on May 6th and it is your turn.